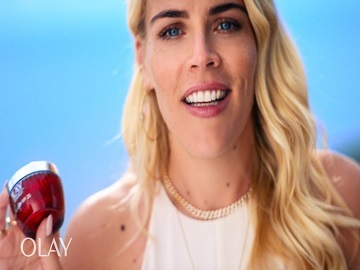 American actress, writer, producer, and director Elizabeth Jean “Busy” Philipps talks about how sun care is self care with Olay Regenerist Whip SPF 25 in a new commercial for Olay. “Sun care is self-care. I used to not love wearing an SPF just because I felt like it was so oily and greasy and then I was gonna clog my pores, but what I love about Olay Regenrist Whip SPF 25 is that it’s lightweight, it’s barely there. And then I can put makeup on over it if I want or if I’m not working, you know, just roll,” Philipps says on the 30-second spot, adding that this product is perfect for her. “I’m Busy Philipps and I’m fearless to face anything,” she also says at the end of the commercial. The brand has also enlisted Haitian-American blogger, advocate, motivational speaker and amputee model Mama Cax (who walked for Chromat wearing a prosthetic leg during New York Fashion Week SS19) to pitch the Olay Regenerist Whip SPF 25. In the past, Olay has also featured other fearless women, such as Aly Raisman, Elyse Fox, Lily Singh, Denise Bidot, Piera Gelardi, Kay Adams, Jilian Mercado, and more, to deliver empowering messages to women, like “Together we can face anything”.